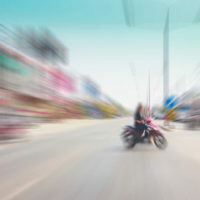 According to one prominent study, about a third of motorcycle crashes happen when the motorist makes an unprotected turn in traffic and steers directly into a rider’s path. Typically, that maneuver is a U-turn, an unprotected left turn across traffic, or a sudden lane change. SMIDSY (sorry, mate, I didn’t see you) crashes might be even more prominent today, because many drivers operate large vehicles, like pickups and SUVs, that obscure drivers’ vision. Moreover, with falling gas prices, the roads may be more crowded now than in any other time in recent years. First responders at the scene nearly always prepare accident reports based on their own observations, interviews with the parties, and witness statements. Then, insurance company lawyers use these reports to determine fault and begin their legal defenses for the courtroom fight that’s probably sure to come, because insurance companies lose money when they pay claims and they will almost inevitably fight to deny compensation to victims and pad their profit margins. The death and serious injury rate in motorcycle-vehicle collisions is so high that first responders usually only hear one side of the story when they prepare their reports. Typically, the tortfeasor (negligent driver) says something like “the motorcyclist came out of nowhere” or “I never saw him/her,” and that’s usually because the tortfeasor failed to keep a proper lookout and not because of the rider’s carelessness. Nevertheless, the insurance company generally uses the “s/he came out of nowhere” line to lay the foundation for a legal defense like sudden emergency. Essentially, the insurance company tries to claim that the victim rider “darted into the path” of the driver and therefore the driver is not responsible for damages. But a sudden emergency defense based on these facts simply does not pass muster. So, even if the motorcycle rider made an illegal turn just before a SMIDSY crash, which is unlikely, sudden emergency usually doesn’t apply. It takes more than well put-together legal arguments to win these cases, because jurors must also be convinced on a moral level that the tortfeasors did something wrong and that the victims deserve compensation. Although it has dissipated in recent decades, the motorcycle prejudice is still alive and well. At some level, many jurors feel that bikers are reckless and dangerous, so they are eager to embrace novel or controversial legal theories that allow them to shift blame to the victim. Thankfully, and experienced lawyer knows how to combat all kinds of prejudice, giving victims a fair shot in court. Motorcycle crashes do not fall under Florida’s no-fault law, so victims are always entitled to damages for both economic losses, such as medical bills, and noneconomic losses, including pain and suffering. Motorcycle crash victims must fight for the compensation they deserve. For a free consultation with an aggressive personal injury lawyer in Brandon, contact Reed & Reed. An attorney can usually connect victims with a qualified medical provider who will charge nothing upfront.